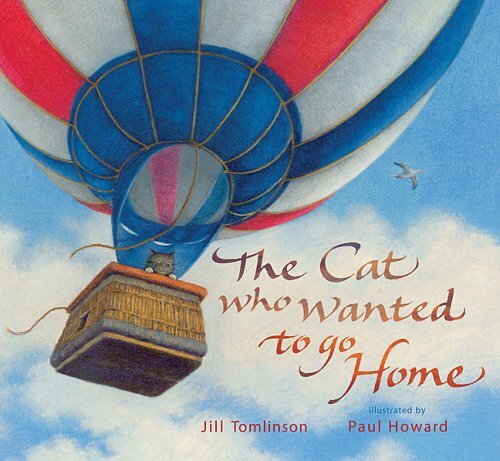 Best known for The Owl Who Was Afraid of the Dark , Jill Tomlinson excelled at warmly written, humorous young fiction titles featuring young animals faced with a challenge. Now her text for The Cat Who Wanted to Go Home has been abridged for this picture book version of the story. Suzy is a French kitten who is unexpectedly transported to England when she falls asleep inside the basket of an air balloon. Although she is taken in by a kind old English lady and her talkative budgie, Biff, Suzy is determined to get back to France. Every day she goes down to the sea-front and tries to hitch a ride home – from a surfer, a water skier, a cross Channel swimmer and a submarine – but all to no avail. Finally, she smuggles herself on board a car ferry and is reunited with her French family and their four boys. This story is full of gentle humour which is echoed in Howard’s warm, pastel illustrations and sepia drawings. There are verbal jokes too as Suzy tries desperately to get all these English people to understand her: ‘Chez-moi!’ she wails in their uncomprehending ears. Only Biff the budgie hears accurately what she is saying, and thus the old lady finally understands that Suzy’s ‘Au revoir!’ repeated by Biff, means that she has found a way of getting back to France. Despite the abridgment, this is a long text for a picture book but it interacts well with the illustrations and is full of rich and interesting detail – some French phrases, ways to cross the Channel, the proximity of France to England and so on. And young readers will of course empathise with Suzy’s plight as she struggles against the odds to find her way home. This picture book format will also be enjoyed by 5-7 year-olds.